HOLDING GOD'S HAND, first published in Guideposts, is a collection of soul-soothing meditations and power-filled prayers that will comfort your spirit when life challenges your patience, courage, resolve and faith. We all have days when nothing seems to be going right and the stresses and strains of life are trying our patience and frazzling our spirits. It's in those moments that we need to pause and take a moment to rejuvenate and refresh our souls in the presence of God. Each is filled with powerful two-minute meditations, plus spiritual quotes, Bible verses, blessings, and scriptural prayers, that direct your thoughts toward a serene and tranquil place of rest-a place full of God's peaceful presence. Think of it as your one-stop spiritual first-aid kit that you will be relieved to have on hand for those moments when life challenges your patience, courage, resolve, and faith. From facing the loss of a loved one, going through financial struggles, or living with chronic illness to everyday challenges of caregiving, loneliness, or grief, these powerful personal stories of perseverance, coupled with practical suggestions for moving on, will quiet your mind, refresh your soul, and place you back in the light and care of God. It's the perfect companion to keep within reach for any time of day or night. Wow! "Holding God's Hand" is an absolutely gorgeous book inside and out. I love this devotional book from the inside out. The stories resonate with my heart and they make feel something that I haven't in a long time. Have you ever read a devotional book that you just sink in and instantly feel at peace? This is one of those devotionals that I read and instantly melt into my chair, sink into my thoughts and give God my worries, my discouragement or ask for guidance in my life. This devotional gets me thinking and praying, while sitting in the arms of my heavenly father. You'll love the stories, which is like reading a short Guidepost article and the scripture that goes with each story is perfect. 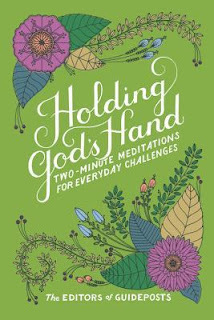 If you're looking for a short devotional and one that has stories to get you thinking, "Holding God's Hand" is perfect. I give this devotional 5/5 stars. Thank you to the publisher for providing me a copy. A favorable review was not required.